I wrote this a few years ago. It’s still mostly true. When I was eight years old, my Father bought a picnic table at a yard sale for a dollar. A whole picnic table, complete with two separate benches. He brought the thing home in the back of the old station wagon – the one with fake wood paneling on the side – and summoned his wife and sons to examine another tangible expression of true thrift. My father was always keeping his eyes open for this or that, and lately, a picnic table had been on his radar. This one was made of a suspicious pine, soft and light enough for an eight year old to carry across the front lawn. It was held together with glue and staples, but the price was right, and somehow, it was still standing two years later under the old Maple, dry-rotted, and listing badly to the left. It was also missing two planks on the surface, making it less of a table and more of a sieve. The following day, my father shored up the broken bench with two by fours. The original wood was too rotten to hold a nail, so he wrapped everything together with duct tape. When the other bench crumbled a week later, it was Scott who plunged downward with a muffled scream and a mouthful of partially chewed chicken. He hit the ground hard, knocking air from his lungs and chicken into his windpipe. Grabbing one of Scott’s ankles in each hand, my Father held him upside down, and began to shake him over the table. When the wad finally broke free, it exploded in a spray of poultry, most of which sailed through the air and landed in my mother’s hair. And so the days progressed, until the contrivance in our front yard could no longer be confused with an actual table. New additions included a car jack, for supplemental support, and the front seat of a pick-up truck brought in to replace one of the original benches – perched optimistically on several cinder blocks. It was actually kind of comfortable, but had a tendency to flip backwards if you rocked on it. In this way, dining al fresco became a kind of adventure, a sort of ‘musical chairs’ in reverse. Gathered around the doomed and rickety buffet, ears cocked, my brothers and I waited for the ultimate crack! that would send us all plunging to the ground under the weight of some dubious pot roast, or unnamed casserole. 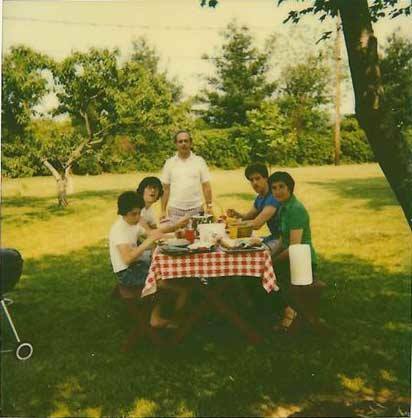 The final meal around the old table took place on a muggy Father’s Day in 1972. Interestingly, it was the day President Nixon signed into Law a proclamation declaring the third Sunday of every June to forever be celebrated as Father’s Day. My father greeted this news with complete indifference. We celebrated the occasion in true Baltimore style, with the ritualistic sacrifice of several dozen Maryland Blue Crabs. My father brought them home in a bushel basket and steamed them alive in crock-pot full of onions and Old Bay seasoning. Now, they were spread across the surface of the decomposing table. Knives and forks were replaced with ice picks and wooden mallets, and the promise of calamity loomed higher than ever. Much has been written about the dangers of crab fishing, but in my experience, eating them is far more hazardous than catching them. They’re served at roughly a thousand degrees. They scald your fingers when you snap their backs off and start digging around in their molten guts. Their edges are razor sharp and pointed, and the Old Bay seasoning, while delicious, feels like gasoline in the inevitable cuts and puncture wounds. For my Father, retrieving the savory meat from this nautical Rubik’s Cube is a highly personal, epicurean sacrament. He sees himself as an Indian skinning a buffalo, or an Eskimo flensing a whale. Ignoring the heat, he grabs one bare handed, flips it over, and slides a bloody thumb under the “apron,” a piece of cartilage that extends from the crabs outer shell down onto it’s belly. Once situated, he rolls his hand backward, removing the shell with a grisly “pop,” sending contrails of boiling fluid arcing in all directions. Into the shells cavity, he dumps the lungs, which he scoops out in one easy motion. Then, he snaps the body in half, exposing a maze of honeycombs and secret chambers, each concealing tiny pockets of hidden goodness. Yellow “mustard” oozes from unseen compartments, which he licks away without hesitation. The large claws are quickly detached and set aside in a special pile, “for later.” Then he removes the back fin, a large hunk of white meat that comes loose with relative ease. Most people eat the back fin the moment it’s freed from its nook – they simply can’t help themselves. But my father places it gently off to the side, a golf ball sized hunk of succulent temptation. Then, the work begins. With surgical precision, he maneuvers his ice pick into every hidden chamber, removing tiny pieces of unseen booty, and stacking them neatly in separate piles. Nothing is wasted. A lesser enthusiast might ignore these smaller bits, but not my father. 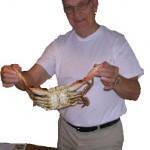 While others eat while they pick, my father waits until the crab is cleaned and gutted completely. Only then will he enjoy the fruits of his labor. For my brothers and me, the best part about eating these prehistoric bottom-feeders is the temporary suspension of etiquette. Spattered with random bits of flying fodder, we swing our mallets and slurp out the meat with no fear of reprisal. Even my mother, who can make Emily Post look like a drunken crack whore, will pick at her teeth with the tips of claws, and spit tiny bits of shell back onto the table without apology. Aside from the normal bleeding, there was nothing remarkable about our last meal around the doomed table. No one fell on an ice pick. No one smashed his finger with a mallet. In fact, the table was still standing when the rain started, forcing us inside, and making June 18th, 1972 a rather forgettable afternoon. Far more memorable, were the events surrounding the day in question. Because fifty miles down the road, and several hours before President Nixon’s First Official Father’s Day began, five burglars were letting themselves in to the Democratic Headquarters in The Watergate Office Complex. And even more interesting was another heist that was about to occur in our own backyard – a spectacular felony that freed my mother of the old picnic table once and for all. I took this to mean that another mysterious relative was dropping by for a surprise visit. My Dad had one regular brother, three half-brothers, three regular sisters, a step sister, a father, one regular mother, and a step mother. Naturally, they all had wives and husbands and cousins twice removed, giving me a family tree that looked more like a wall of ivy. Agnes however, was not some long-lost Aunt. She was a tropical storm, recently upgraded to a hurricane, and apparently headed our way. My father was not taking questions, and when Agnes finally arrived, there was no time for answers. She was a most unusual June hurricane, and indeed, a very nasty broad. She made the turn as feared, sliding into the mouth of the Bay, slipping down her throat, and then, shooting over to Trumps Mill Road, across the old wooden bridge, and straight up the hill to our backyard. On the second day, the creek jumped its banks, and slowly crept up the hill, surrounding our farmhouse with brown, churning water. From the top of our hill, we could do nothing but watch the floodwater rise. When the electricity went out, our sump pump stopped working, and my father bolted into the cellar, and began to bail furiously. I suppose we should have been scared to death, but with my mother playing the piano upstairs, and my father singing, “What Will We Do With a Drunken Sailor?” as he bailed, things were more weird than frightening. Late that night, the rain let up and the water started to recede. And when dawn finally arrived, we ventured outside to see what Agnes had left behind. Imagine a junkyard, inverted, and shaken. There were chests of drawers with clothes still inside, and an empty cash register. An Oriental rug dangled from the mulberry tree. We were entirely surrounded with flotsam and jetsam, swept up from towns and neighborhoods north of Baltimore, and dumped in our yard. Scott found a pogo stick and a naked mannequin, which freaked him out. There was a bag of golf clubs in the flowerbed, and a dead pig in the driveway. But it was my Mother who first spotted the phenomenon in the front yard. There, beneath the old Maple, was a brand new picnic table. It was enormous – a majestic assemblage of white oak, painted a sensible forest-green, and held together with man-sized bolts and twelve-penny nails. Around one of its muscular legs was wrapped a heavy chain, which stretched out behind it like a prehensile tail, giving it an animated, renegade quality – a fugitive picnic table, on the lamb!It was quite simply, the picnic table of my mother’s dreams, squatting serenely in the surrounding detritus, inexplicably delivered to the precise spot last occupied by its dilapidated predecessor. The reality took a moment to comprehend, and judging from the way my Mother’s mouth kept opening and closing, she was still in the moment. “Michael. Go get your father.” I found my Dad on the other side of the house, trying to explain the actual purpose of mannequins to my weeping brother. My enthusiasm must have intrigued him, because he left Scott with the naked mannequin and followed me back to the Maple tree, where his wife continued to regard the unlikely sight in much the same way that Moses might have beheld the Burning Bush. Skeptical that a Higher Power would choose to bless him with outdoor furniture, my Father approached the table warily, kicking its legs like the tires on a used car. He appraised the attached chain, then spied the stenciled lettering burned into the wood. Property of The Department of Recreation and Parks. My mother understood the statistical improbability that such a weird coincidence could occur in her own front yard. Given her daily prayers for a new table, the sudden presence of this one suggested the work of a Higher Power. If not delivered by the hand of God, it had clearly been sent by somebody, and rejecting a heavenly favor or cosmic endowment seemed preposterous. Alas, my father was not predisposed to consider the possibility of divine intervention. Nor was he persuaded by my mother’s fallback position, which argued that possession was nine tenths of the law. After much debate, he called State Police with “information on the missing table.” Shockingly, the officer who answered wasn’t up to speed with the specifics of this particular case. The cop took our address, and told my Father he’d pass the information on to the park service, who would no doubt drop whatever they were doing and send a couple of Rangers over at the first available opportunity to retrieve the table. The next day was clear and beautiful, the way it often is shortly after Mother Nature tries to kill you. Our house was trashed, and our yard looked like an upside down dump, but underneath the lopsided Maple, there was little to complain about. The Hurricane Agnes Miracle Table had been scrubbed clean, and it was magnificent. My father conceded that using it in the short-term was ethically acceptable, so five days after President Nixon’s first official Father’s Day was rained out, we picked up where we left off. My mother covered the smooth oak planks with paged from The News American, onto which my father dumped a bushel of steamed crabs, piping hot, and smelling of Old Bay. For once, there was space to spare – and not just for the crabs. There was room for potato salad and ears of corn and thick slices of ripe tomatoes, fresh from my grandmother’s garden. There was also room for my grandmother, and my grandfather, as well as my brothers and me, a second-cousin whose name I don’t recall, and a mannequin named Molly that Scott had grown weirdly attached to. And of course, there was room for my Father, who sat uneasily at the head of our new table, waiting for the park rangers to come speeding up the long driveway to reclaim their missing property. Naturally, the rangers never came, and over the years, he would come to see the table as his own. 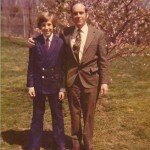 But 37 years ago, his good fortune was tempered with worry and gratitude – two qualities that continue to define my Dad. That’s how I’ll remember the third week of June, 1972. Steamed crabs, a flooded basement, a break-in at The Watergate, and a picnic table that may or may not have been sent from above. 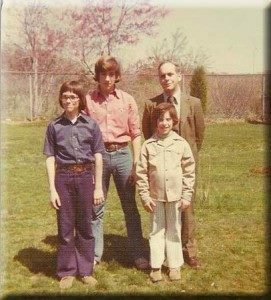 It was a confusing time for a ten-year old, but thankfully, my father was there to explain it all as his family dined al fresco, in the style to which we had become accustomed. This Father’s Day, another table full of steamed crabs will mark the occasion. And even though I can’t be there with him, it makes me smile to know that each one will be picked clean, and not one morsel left behind.